This three-story facility was built on an extremely restricted city site with rooms ranging around a central courtyard. 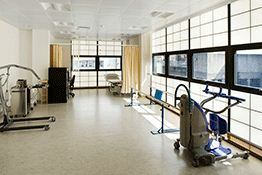 The Pearse Street Medical Centre in Dublin provides general practice care for the local community, including physiotherapy, occupational therapy and nursing clinics. The brief included the need to maximize daylighting in the building envelope without increasing heat loss, while reducing energy and running costs of air-conditioning, heating and artificial lighting. The architects have made extensive use of the Kalwall daylighting system, which diffuses natural daylight and casts it evenly and deeply across the interior, without the presence of shadows or glare or the need for solar control. It also eliminates the need for any curtains or blinds. In order to maximize insulation, LUMIRA® aerogel is used within the Kalwall panels. This resulted in a dramatic insulation 'U'-value of 0.28W/m²K — equivalent to a solid wall — thereby increasing the energy-saving performance and reducing lifecycle running costs. The daylighting system also incorporates the innovative highly efficient Kalwall Eurowindow vision panels, designed to facilitate external views and optional ventilation. Architect Helen Giblin of A&D Wejchert & Partners says, "This building is on a very difficult site in Dublin's city center, providing a vital service for the community and is very busy. As it is a local authority facility, it was important to adopt technology which would minimize the running costs of air-conditioning and heating. At the same time, we wanted to flood the building with natural daylight which would also save on artificial lighting and create a pleasant interior ambience for both patients and staff. By adopting this highly insulating method we have fulfilled both goals and, at the same time, added the benefit of privacy that, without blinds or curtains, is not possible with conventional clear glazing. Kalwall + LUMIRA aerogel has proved to be the ideal solution."